Danes even have a word for it: arbejdsglæde or “happiness at work”. Well, we liked the sound of that and so we’ve put it in practice, spicing up some processes and project management techniques, and adapting them to our company ethos: open, creative and fun-loving. That’s why we have a monthly SCRUM poker session. Find out how to liven up you’re SCRUM planning sessions just like we did – you can even download our customized SCRUM poker cards, free! You may know about SCRUM, an Agile approach to project management, notably used in software development. Basically, it is a framework that helps teams reach their objectives in short cycles (sprints), enabling fast feedback and continual improvement. As an Agile framework, it puts individuals and interactions ahead of processes and tools. You may also know about SCRUM Poker (aka Planning Poker). During sprint planning in SCRUM, poker-like cards are used as a unit of measure for estimating the “size” of a task. The points assigned to the task will help the team estimate how long it will take to complete each task: how difficult it is likely to be, and what will be included in the next sprint, based on this estimation. If you think that SCRUM poker had already reached the height of creativity in the Agile world, think again. At Justinmind there’s always room for imagination. The team adopted the SCRUM practice some time ago. As a result, the focus shifted to the tasks that the whole team valued as most important “right here right now”. This soon proved to be successful as the team was able to improve productivity thanks to more precise estimation and a better and more realistic organization of tasks within a range of different sprints. Improve SCRUM with a Justinmind prototype. Download now. Like everywhere else, at Justinmind each task in the backlog is evaluated with points: 1 or XXS for an extra-easy task, 2 or XS for an easy task, and so on up to hard or complicated tasks, which get 8 points or an L, and “epic” tasks, which need to be fragmented and are appointed 16 SCRUM points or an XL. 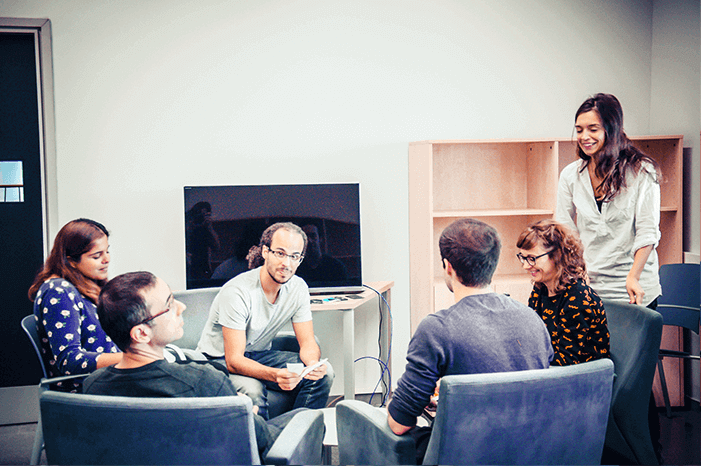 The team evaluates task difficulty before starting a Sprint. Problem is, an open evaluation and voting process is subject to influence. What is evreyone says a task is super esay and you suspect it’s super hard? You might feel pressure to change your evaluation, right? And if you’re SCRUM master or your boss says it’s an easy task… pretty hard for you to vote otherwise! That’s why we decided to get into SCRUM poker and have some fun during the 2-hour long meeting we have at each sprint planning phase. In SCRUM poker, each Agile participant decides on the difficulty of a backlog task in secret, and evaluates the task using a playing card. No peer pressure, just better evaluations and better office vibes. 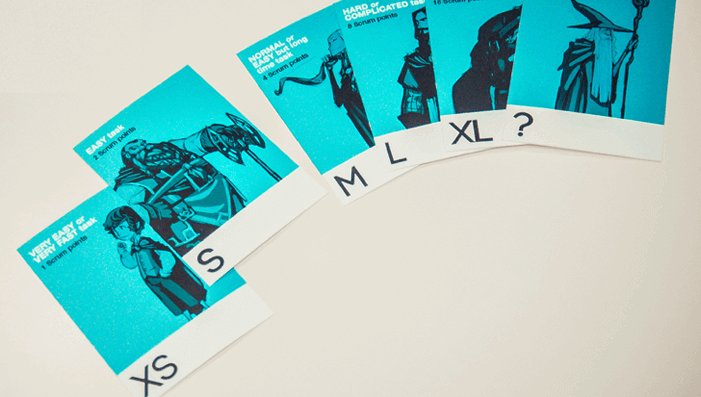 We downloaded ready-made cards from the web: every card shows a t-shirt representing a different size reflecting the scope of the development goal the team had to evaluate. However something was missing: more fun, and the Justinmind touch! 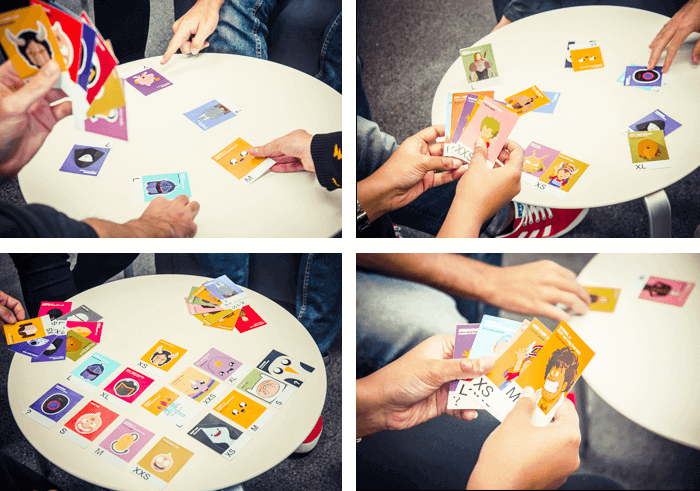 That’s how we came up with the Justinmind customized SCRUM cards. Sergi, the lead designer and a big fan of Frodo & Co., designed the cards with the Justinmind colors and the characters of The Lord of the Rings on them. The importance of the characters of the popular saga reflected the possible size of the development objective that had to be estimated. This spiced things up and made them more engaging, but there was still more to be done. From customized memorabilia cards, we moved on to personalized cards for each team member. Though The Lord of the Rings is indeed one of Sergi’s favorites, the rest of the team didn’t quite share his interest, and now everybody wanted their own. Great task for the designers, who had some fun creating different cards for everyone. 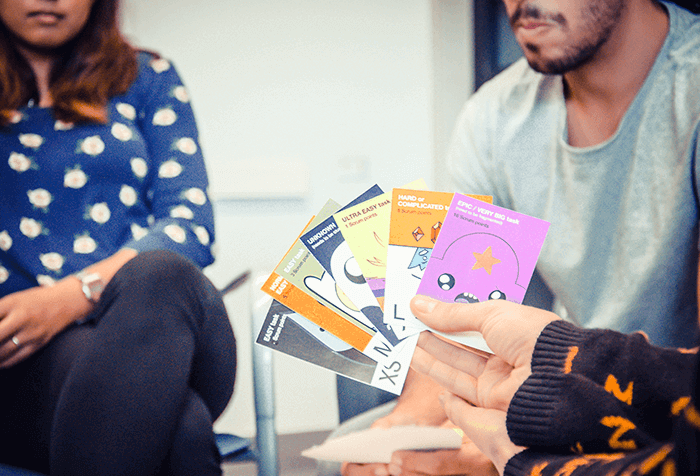 Everybody was asked to decide what we wanted on our personalized SCRUM cards, and soon manga series, comics, and sagas made their way into SCRUM, to make it enjoyable, as well as more “personal”. All team members sent detailed requests on how we wanted their cards, and it was interesting to see how we assigned the varying values to the characters. Which character should be assigned the highest number of points and which one the lowest? The most/least important? The favorite or least favorite? In some cases, it was a matter of physical stature, which certainly has an impact from a design or an aesthetic point of view: “I assigned the points to the characters according to their physical size”, Jordi says, who chose the Japanese manga series Dr. Slump. Bernat and Carles went for other Japanese manga series, One Piece and Kinnikuman (aka Muscle Man), but they assigned points according to the strength of the characters: “The weakest character got an XXS and the strongest an XL”. Each team member chose a saga hero too, which is their alias and profile picture in the Agile project management tool the team use to manage each sprint. Wouldn’t you like to work with Daenerys, Finn and Jake, and Kinnikuman every day? Who wouldn’t?! Result? A more efficient and enjoyable SCRUM! The Justinmind SCRUM poker follows and enhances the SCRUM values of focus, courage, openness, commitment and respect, which are the foundations for the team’s processes and interactions. Now everyone has personalized cards and his or her own hero alias, and this makes the 2-hour SCRUM meeting and the Agile practice less stressful and overall more enjoyable and productive. For each task taken from the sprint backlog, a discussion follows, and then it’s time to play cards: it’s about estimating and reaching a consensus on the projected workload, but it looks completely different. And cool. The dynamics created when sitting down and “playing poker” put everyone in a more relaxed mood, which in turn made people more inclined to speak freely and openly, without restraints, and to give their opinions and points of view that contribute to making the estimation more precise, and consequently, the whole process more efficient. The fact that each team member plays with personalized cards enhances the whole process. The different cards reflect the different personalities behind each team member, contributing to a sort of getting-to-know-each-other-better experience. People open up and work as a team as part of a unified process, thus reinforcing the feeling of having more resources to undertake greater challenges. It also reinforces the commitment of each team member to success, and the respect for one another. In this way, the planning and evaluation phase plays out more smoothly, in a positive atmosphere, and with a few laughs along the way. Several studies have already demonstrated that happy workers are more productive. 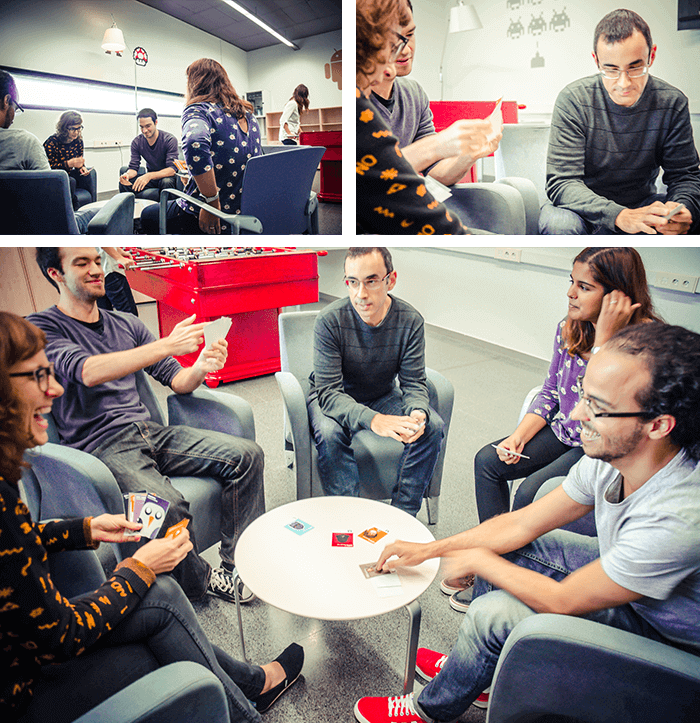 With our very own SCRUM poker, we’re happier than ever, and we’ve improved the development process too. What about creativity? We know that we can’t force it, but our innovative ways of working certainly help the team get in the right frame of mind to find imaginative and efficient solutions for Justinmind prototyping tool. We’re all the better for having spiced up our SCRUM. So go on, you too can have more fun!